Be better at balancing it all. 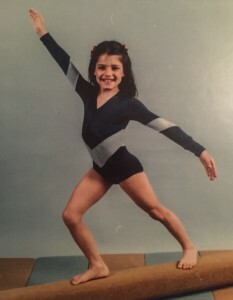 So here I am at about 7 years old… posing happily on a floor balance beam. Only one month before, I had been selected as the newest member of the gymnastics team. In this picture, I see a little girl beaming with pride and joy. I absolutely and completely loved the sport of gymnastics. Gymnastics consumed my every minute. When I wasn’t in the gym, I was day-dreaming about it. And, for many of my childhood years, cartwheeling was my primary mode of transportation. It was fun, fast and easy (ah, the days of youth!). Aside from gymnastics (although not much mattered to me besides gymnastics), I loved hopscotch, and jacks and ping-pong. As the years progressed… I became more serious about the sport. I was training every night of the week after school and competing every weekend. My coaches were tough and the pressure to push the boundaries of my abilities (and my fears) was constant. My life – thoughts, feelings, and body — were consumed by rigid rules and expectations of precision and perfection. What I realized much later in life… (through a lot of personal work and a yoga therapy session that integrated this realization for me), was that the strict “rules” of the balance beam had been internalized in my psychology…and became the metaphor for how I lived my life – where there was a right way and a wrong way, where timing was vital, and where every nuanced movement meant huge success or major failure. My thoughts, decisions, and choices in life left little room for freedom, creativity, or simply the idea that there are many “right ways” to be. Life felt (falsely) safer and clearer… moving along a self-imposed narrow mental path, much like a 4-inch balance beam, with little room for error. However, the freedom and fun of sloppy, fast cartwheels through open grassy fields and hotel lobbies was long gone. Gone were the days of hopscotch using random objects or rocks found the side of the street as pieces and lopsided boards made with broken chalk. Although I looked graceful on the outside, I was robotic and rigid on the inside. Not much balance there (and the illusion of safety was long gone too!). It’s important to note… the gifts of the balance beam part of me have served me well. I can be organized, structured, reliable, and highly productive. 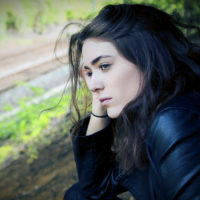 They have also worked against me, when needing to allow for possibility and mental flexibility (which is possibly one of the most vital keys to living a happy life). So, when the occasion calls for it, I have had to learn how to access the hopscotch-playing-messy-cartwheeling part of myself, and let the structured balance beam part take a rest. Sometimes, I consciously access both of these parts and when they work together in tandem, the balance of the two creates amazing things, including a nice big exhale in my body and mind. Being able to consciously choose which part to access has taken a lot practice. It has required that I tap into all of myself and do my inner work. Because so many people struggle with creating “balance” in their lives. Maybe you do too. Remember, your internal challenges are reflected in your external challenges. For example, if you struggle with balancing work with fun, this is reflecting something out of balance that lives inside you. If you struggle, like I did (and sometimes still do! ), with the balance between structure/responsibility versus spontaneity/creativity, this originates from inside you too. Some core struggle or block keeps you from equilibrium in your body and your psyche. I know, this is pretty DEEP stuff. But it’s true. And if you peel a few layers back, I know you’ll find that it’s true for you too. Balance is a practice that shifts and changes, just like you! It’s a process. Stand on one leg, lift the other leg straight out in front of you, as high as you can. Try to stand tall in your spine (don’t lean back). Bring your arms straight up by your ears. Keep your both legs straight. Continue lifting the leg that’s off the ground higher. Hold this for at least 30 seconds, then lower your lifted leg. Reflect on your 30-second physical balance experience. Did you notice wobbliness? Did you eventually come to equilibrium? Maybe, just as you found your center, you begin to wobble again? Maybe, you fell? Body-balance works the same as internal mental/emotional balance. It’s never permanent, it’s always shifting, and there’s always work required to come back to equilibrium. You will wobble. You will fall out sometimes. And sometimes, you will get it just right. The beauty is that when you learn what balance feels like in your body and your mind, you can more readily access it anytime under any circumstances. The emotional impact of being out of balance…? How to get to your deeper layers…? How learning to balance to these parts of yourself can enhance your life – your relationships, your mental health, your attitude, your work, your appreciation for life, your mood, your success…? Worth some consideration, no? For me, it has been a game-changer.